Murray Polner is the author of No Victory Parades: The Return of the Vietnam Veteran and is co-editor, with Thomas E. Woods Jr., of We Who Dared Say No to War. Suddenly and surprisingly, we have a Bush-like Obama Doctrine. To the applause of liberal hawks and formerly critical neocons, the president declared in his Nobel Peace Prize speech that the U.S. will continue to wage war—though naturally, only “just” war—anywhere and against anyone it chooses in a never-ending struggle against the forces of evil. His antiwar supporters can take seats on the sidelines. It’s all reminiscent of John F. Kennedy and the prescient George Ball, and afterward Ball and Lyndon Johnson. In the early ’60s, JFK—reluctantly, we are told by his admirers—decided to send 16,000 “trainers” to Vietnam to teach the South Vietnamese how to play soldier and to stop the Communists from sweeping over Southeast Asia. Vast quantities of money and assorted advisers were shipped without accountability to the corrupt gang of thugs running and ruining that country. Ball, the one dissenter in Kennedy’s entourage, pleaded with JFK to recall France’s devastating defeat in 1954 at Dien Bien Phu and throughout Indochina. “Within five years we’ll have 300,000 men in the paddies and jungles and never find them again,” he warned the liberal icon in the White House. But JFK thought he knew better, caustically answering, “George, you’re crazier than hell. That just isn’t going to happen.” Ball would also press Lyndon Johnson to stand down in Vietnam before he destroyed his presidency, domestic agenda, and more importantly the lives of tens of thousands of American soldiers and their families, not to mention a few million Southeast Asians. But LBJ wasn’t going to be the first president to lose a war and be blasted by pugnacious home-front warriors. Failing to stop the North Vietnamese would sooner or later have us fighting them on Waikiki Beach, or so the Cold War line went. Ever since then, we have continued to hear about regional menaces that supposedly, if left unchecked, will threaten vital U.S. interests or even Americans at home. Ronald Reagan employed that rationale in defending the proxy war in Central America waged by U.S.-backed Contras. George H.W. 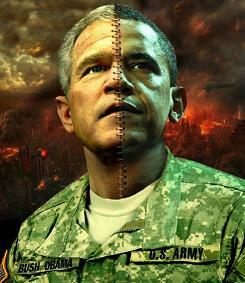 Bush and Bill Clinton extended the tradition of intervention, sending troops to theaters of combat as far-flung as Panama, Kuwait, and the Balkans, while the second Bush launched invasions of Iraq and Afghanistan. They have all been war presidents. But Barack Obama was going to be different, or so my fellow antiwar liberals— and a few antiwar conservatives— hoped. He was to herald the end of that uncompromising and unilateral era of preventive war. The hundreds of thousands who joyously greeted the president- elect in Grant Park or the 1.5 million at his inauguration were ecstatic with anticipation. Left-wing pundits wrote excitedly about FDR’s One Hundred Days and projected great plans onto the new Man From Illinois. In countless articles, Republicans were declared brain dead, and the Bush- Cheney policies that got us into Iraq, Afghanistan, and the torture business were buried. One year after those celebrations, it’s the neocons cheering, seeing in Obama’s policies a vindication of the late administration. Who would have dreamed that following Obama’s West Point speech announcing 30,000 more troops destined for Afghanistan, William Kristol would laud Obama in the pages of the Washington Post, writing, “the rationale for this surge is identical to Bush’s,” and praise the Democratic president for having “embraced the use of military force as a key instrument of national power”? War makes strange bedfellows. Michèle Flournoy, Obama’s under secretary of defense for policy, has been invited to speak about the president’s hopes for a new Afghanistan on a panel led by Frederick W. Kagan at the American Enterprise Institute, the heart of neoconservatism. Why did Obama buy what the hawks sold him? What if he had leveled with the nation and acknowledged that, however obnoxious and cruel the Taliban may be, they pose no danger to the United States? What if he had vowed that we would not dispatch tens of thousands of additional troops to a civil war in an agrarian, impoverished, largely illiterate country divided by tribal loyalties? It was not to be. Instead, as New York Times columnist David Brooks stated approvingly, “With his two surges, Obama will more than double the number of American troops in Afghanistan.” Charles Krauthammer was direct and sharp: “most supporters of the Afghanistan war were satisfied. They got the policy; the liberals got the speech”—and no say in the construction of that policy. After West Point and Oslo, neocons saw Obama as a more coherent Bush, an electrifying orator who had dazzled antiwar Democrats and independents and then promptly dumped them. When the New York Times printed a photo of the men and women who helped Obama reach his decision to escalate, not one dove was present. Were there no alternatives? In this huge country, could he not find a handful of realists, whether Left or Right, to supply some workable ideas for eliminating third and fourth tours for our overextended troops and the resulting suicides, amputations, epidemics of post-traumatic stress disorder, and legions of weeping relatives at gravesides? Hold on, Obama’s loyal liberal defenders counter, shuddering at the memory of Bush. Why blame him for the miserable decisions he has to make based on impossible situations he did not create? They would prefer not to explain why they and their allies in the think tanks and Congress have so little influence. But these protests notwithstanding, we remain—and will throughout Obama’s presidency—an empire of military colonization, the goal for decades of neoconservatives and assorted liberal hawks. In anthropologist Hugh Gusterson’s wonderfully evocative words, “The U.S. is to military bases as Heinz is to ketchup.” American forces are stationed at approximately 1,000 military bases in 120 countries at a cost topping $100 billion annually. Diego Garcia, a remote island in the Indian Ocean midway between Africa and Indonesia, is apparently so essential a base that 5,000 locals were thrown out of their homes so the U.S. could have yet another top-secret facility from which to conduct its perpetual wars. In another instance of history repeating, the first Obama defense budget has been virtually the same as Bush’s military appropriations. Obama has reduced spending on Cold War weapons such as the F-22 fighter, but he reportedly plans to ask Congress for an extra $33 billion for the ongoing wars in the Middle East and Central Asia. To his credit, the president is trying to negotiate a new nuclear-arms reduction pact with Russia and close a few of the CIA’s clandestine prisons. But in many other vital areas of defense and national security, like warrantless wiretaps and renewal of much of the Patriot Act, he persists in activities that violate fundamental freedoms. He has also refused to hold anyone from the Bush-Cheney era accountable. Barack Obama happened. More eloquence than substance happened. More time-honored political caution than audacity or hope. Liberal and conservative Cold Warriors as key advisers. A reluctance to cross wartime profiteers. A recognition by his poll-counters that, with future elections in mind, it was best to govern from some ill-defined center, acting tough abroad to keep the neocons off his back while throwing an occasional bone to his left. That strategy may buy him a second term as fruitless as his first—or it could render him indistinguishable from his deservedly maligned predecessor and cost him re-election in 2012. The Left howls now, but from the very start, Obama signaled his lack of interest in McGovernite ideas of change in foreign policy. There was a time when he talked about pressing Israel to dismantle its settlements. But thus far he has been cowed by Netanyahu and his American backers, betraying any hope for a genuinely independent Palestinian state. There was that stirring speech in Cairo and then silence. There was talk about closing Guantanamo but no mention of the much larger Bagram prison in Afghanistan. Yet just as certain as opposition to foreign adventuring arises, again it goes unheeded. As we begin President Obama’s second year in office, of this we can be certain: in global affairs, but for a few crumbs here and there, antiwar views will rarely be welcomed by this White House. And when these marginalized voters complain, all the president’s men will remind them that they were told Afghanistan was a “necessary war” and “national security” is everything. I can imagine Obama’s advisers confidently telling him that however many troops he ships to these and future wars, however much money he spends on military hardware, his anguished allies have no place else to go. Plus ça change.